Explanation: Sunday, the sky seemed to smile over much of planet Earth. Visible the world over was an unusual superposition of our Moon and the planets Venus and Jupiter. Pictures taken at the right time show a crescent Moon that appears to be a smile when paired with the planetary conjunction of seemingly nearby Jupiter and Venus. Pictured above is the scene as it appeared from Mt. 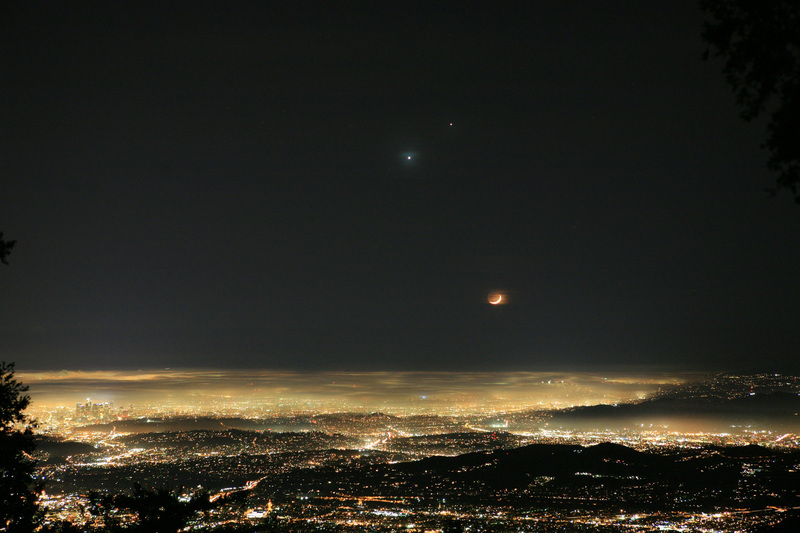 Wilson Observatory overlooking Los Angeles, California, USA after sunset on 2008 November 30. Highest in the sky and farthest in the distance is the planet Jupiter. Significantly closer and visible to Jupiter's lower left is Venus, appearing through Earth's atmospheric clouds as unusually blue. On the far right, above the horizon, is our Moon, in a waxing crescent phase. Thin clouds illuminated by the Moon appear unusually orange. Sprawling across the bottom of the image are the hills of Los Angeles, many covered by a thin haze, while LA skyscrapers are visible on the far left. The conjunction of Venus and Jupiter will continue to be visible toward the west after sunset during much of this month. Hours after the taking of this image, however, the Moon approached the distant duo, briefly eclipsed Venus, and then moved on.